Any must sees in Amish country in Ohio? I’m going to be moving to Ohio (cold!) and I’ve just started thinking about what there is to see in Ohio and neighboring states. In the future I will ask a more general question about sights to see, but for this Q I am specifically interested in the Amish country. It would most likely be a day trip, so a specific farm, museum, or restaurant would be great. I was thinking about going to Smucker’s, just because it’s such an icon, but would also want to have a nice meal, maybe on a farm? You’re going from Fl to Ohio? Are you f***ing nuts? You’ll freeze your nads off. You don’t come this far North unless you’re nuts. Although the food is amazing. God they have something that touches them and their food. Swing up to NYS and I’ll show you some special places. Whereabouts in Ohio? I’ve been there, lived there – there are some wonderful places, depending on where you end up. The serpent mounds – for sure. One thing about Amish country – drive slowly, because those buggies only are going at about 2 mph. @elbanditoroso Really good point. Watch out for the buggies. They don’t always have the slow moving vehicle signs on them. Anything dark, brake. ~ I think Ohio state law requires every home to have at least one of those baskets in a bathroom. @LuckyGuy That building is amazing. I want to go there for the food. @Adirondackwannabe and @LuckyGuy – I’ve driven by that several times. You can see it from 5 miles away. Funniest structure I have ever see. 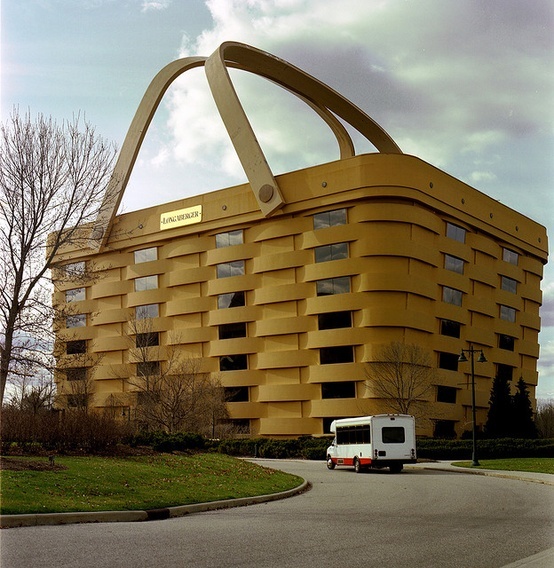 Alas, Longaberger is not the local titan it once was. But it is quite the local landmark. people come by and stop to take photographs of it. There is also a (confirmed) rumor of a local pilot who flew through the handles of the building. Lehmans Hardware is a great place to visit in Amish country. There are many other attractions close by and restaurants. The Newark Earthworks is a smallish bit of a once great complex of prehistoric mounds. Pretty neat, but I wouldn’t go way out of my way to see them as the museum is small and a large part of the earthworks are encompassed by the local golf country club. The majority of Amish stuff is north and east of Newark. yup afraid I live here. Funny, you should say Amish restaurant, because that is what I was going to say. Go to an Amish restaurant for dinner, which is often served family style. The food is very fresh and good, prepared simply. Comfort food. Don’t forget to pick up some whoopie pies for dessert (but they are very sugary so I would consider them a once-in-a-while treat). Also, an Amish farmer’s market is a worthwhile stop. No, I’m not crazy, just married. My husband was laid off three months ago and Akron is where he landed a job. I’m already in a little bit of withdrawal thinking about leaving the warm FL sun. @JLeslie Okay, just learn your cold weather skills for the Winter. Dress in layers and get a really good coat. I have one from Pacific Rim, it’s a division of London Fog. I have seen minus 35 degrees F here in NY. That is cold. But the birds love to be fed in the Winter and it makes you appreciate Summer even more. If you have any questions just ask. ^^You sound like my dad. I went to school in MI, which is colder than normal life, because I had to walk across the tundra (campus) to class. LOL. In real adult life I’ll have a car to take me from place to place. @JLeslie Oh crap, does that mean I’m getting old? I’m just careful in the cold, it can do a number on you. Plus I love the north country. That’s even more desolate than down here. If I’m old you’re old. I just really care about being warm in my house. I’m not worried at all about outside. I laid down the law, the house will be kept at 72 in the winter. I want a smaller house with lower ceilings. Not low, but not vaulted to 14 feet. My husband wants a one story, but I want my husband to be open to bedrooms upstairs to be cozy at night. If it’s a ranch I want it zoned well so I can be warm in specific rooms. We’ll see how it goes with the house hunting. I hate heating a whole house when it’s not necessary. @JLeslie Nah, we’re both just kids. I’m with you on the house not being cold. Have you looked at the electric faux fireplaces? We got one, and with just two light bulbs it heats the entire living room and dining room. If you leave it on too high it will drive you out of the rooms. And it’s cost efficient. For winter I do recommend you keep some get-home supplies in the event you become mired in traffic in the cold. Somehow it brings out the stupid in some people who think the speed limit is a suggestion on ice and snow. A Blanket some food, a pee jar, flashlight and batteries, stuff like that to make the wait more bearable. An 8 oz bottle of canola oil is useful to carry in your winter car kit. It can be used to start a fire. It can lubricate things that are iced over. It can run a diesel engine enough to get a car off the road. It is 2000 food calories. (2000 kcal.) If you are totally stranded and drink it slowly it can keep you alive for 2 days. Akron used to be a major pit, but the city is so much better now than it was 25 years ago. Good universities, it’s a wealthy town. Good music at Blossom Music Center, but just enough south to avoid the Cleveland lake-effect snow. You’re ending up in a good place. Here in my neck of the woods (southern NY), winter last year was terrible, in my opinion, summer was way too short (everyone around here agrees), and now it’s like we’re doing that inevitable, sad slide back to winter. Believe me, I am not looking forward to the winter. Once I moved to FL many years ago, every time someone from up north says, “I would miss the change of seasons,” my reply is, “because you don’t know any better.” For people who love winter sports it’s understandable, or have some sort of ailment where the heat is extremely difficult for them, I can see it, otherwise, living in a climate where most everyone pays to go to for vacation is a true treat I’ve never taken for granted. All year long I can get my mail in flip flops, and they are much cheaper than boots. My average energy bill in my 4,000 sq ft, 12 and 10 ft ceilings is $180 a month (I think it will work out to that. I’ve had bills as low as $115 and as high as $250, and I moved in in March). The first winter will be a real experience and the learning curve for driving and just stuff in general will be like drinking from a fire hose. Piece of cake after the next couple years. Be watching yard sales for a snow blower. @majorrich Again, I went to school in Michigan. I had a car, and I had a job my senior year. I grew up in NY and the DC area. I’m not new to cold and snow. My husband will have a little bit of a learning curve maybe, but even in TN and NC he had to deal with bits of snow here and there. It’s not the same as up north, because in the southern states it’s a sheet of ice (often scarier than MI honestly) but what he hasn’t experienced is such a loooonnnngggg winter. I got my first Yooper Scooper last winter. They are quite uncommon in Ohio and nobody seems to know what I am talking about when I ask about it. I’m thinking I’d like to pay a maintenance rather than own my own yooper scooper. I’ve never been to Akron, but my experience in smallish cities in the Midwest is maintenance free living isn’t very popular, available, nor fabulous like what we have in Florida. I’ll know soon. Plus, I don’t know if I can get my husband to live like that since he’s prefer garage space for all of our cars and trailer at our house. Now that I’m retired and the youngling is out of College, Momma and I are looking in a southerly direction to escape the seasons we have here. I love FL. I highly recommend it. You will still see all of your friends and family, because they all come visit. ^^^ LOLZ I can readily see that happening! We’ve also been pondering AZ area foothills for my wifes sinus’. AZ would be very Midwest of you. Lol. I much prefer the humidity to the arid and incredibly hot air of the southwest. That’s a personal preference. I have been telling everybody that after the terrible winter we had last year I can see why people want to move south when they retire. Not necessarily Florida but maybe the Carolinas or Virginia. Also, other than the weather, cost of living is lower. I know at least four people or couples that have moved to North Carolina in the past few years. I lived in NC for a couple of years. Quite a few people there are “halfbacks.” They go to FL, find it a little extreme, and go halfway back north to the Carolinas. I don’t know all that is available for retirees in NC. From what I understand a lot of them go to the Asheville area. I really like the active adult communities in parts of FL. They are like resorts. Some are practically cruiseships on land with pools, tennis, clubs, social director, gym, restaurant, etc. maybe the Carolina’s have similar amenities? The Carolina’s certainly have golf communities, which often are very similar, but dues can be higher. Southeast FL is very NYish. The west coast of FL has a lot of Midwesterners. Where I lived in NC it still felt like the south. Probably that is changing in NC as more people retire there. I would think of the places in different ways if I had a child in school compared to if I was just retiring. Someone said to me “where you’ll end up will depend on where your daughter ends up.” I definitely can’t think about moving until at least my daughter gets out of HS, which is a long way away. @JLeslie – you’re right – one of the guys at work who retired said he was moving to Asheville. I googled it and they describe it online as the “Hippie Capital of the South.” It’s in the mountains, lots of nature stuff to do, etc. When I googled, one thing I didn’t like about North Carolina is that they just approved fracking. That bothers me a lot. I don’t like fracking either. I’m confused whether FL allows it or not? Someone told me there is fracking near the Everglades, but someone else told me proposals to do fracking in FL have been voted down. I should probably research it a little. I also don’t like nuclear power plants, but they are in so many states, it’s difficult to rule out a state based on that. I would want to live close to one, and preferably not down stream from one. The Carolina’s had quite a few, but so does NY. I’m pretty sure northern OH does too. I seem to remember there are several that are near the shores of the Great Lakes in the states with Great Lake shores. My wife and I used to like fracking a lot. But since I’ve been Ill fracking is something we do not. Who are your favorite dead authors? What is a recurrent dream? I'm driving up I75 in January, anything I should stop and see? Have you ever visited a "Ghost Town"? Fun stuff to do and good stuff to eat in Cleveland, OH? What are some must-see sights in Barcelona, Spain?